After an intense month’s work, with the entire team constantly on the move and the cellar buzzing with activity, calm returns little by little. We draw off our last red of the year and then know that the harvest is officially over. There follows the tasting of our new wines, a rediscovery of the work accomplished and initial assays in assemblage for the 2017 vintage. The cellars begin to cool along with the weather, so that the wines can go through tartaric precipitation for the next 6 to 8 weeks—with the exception of those destined to mature in oak barrels. Meanwhile, the team devotes itself to the 2015 and 2016 vintages, which are now finishing their barrel maturation. The barrels of CAYAS 2015 are emptied, along with the 2016 Cornalin, Merlot, Cabernet and Pinot Noir. Now begins the lengthy cleaning and maintenance of the empty barrels to prepare them to receive the new vintage. The barrels to be used are carefully selected. We busy ourselves with applying bordeaux-colored paint and arranging them row by row and level by level. . . Finally, the 2017 vintage is transferred to the barrels. 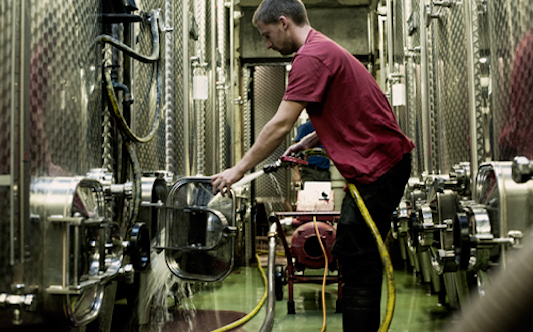 From here, each wine, whether in tank or barrel, begins its maturation leading to bottling. This period will be rhythmically marked with regular tastings, care for the evolution of the wines, completion of the assemblages and light filtration. As for the team, it can take advantage of the calmer winter months before the new season begins and propels us anew to the harvest of 2018.